In 2014, Auburn University scientists in the Department of Biological Sciences’ Molette Biology Laboratory for Environmental and Climate Change Studies and University of Florida researchers shook the foundation of evolutionary biology: for more than a century, researchers believed sponges were the earliest living lineages of the animal tree. Thanks to modern genomic sequencing techniques, Auburn scientists, together with scientists at the Universities of Florida and Alabama, provided novel evidence that ctenophores, or comb jellies, are actually at the base of the animal kingdom. The research results were published in the journal Nature, sparking a debate amongst the scientific community. In an effort to further clarify and establish the new discovery, Auburn University’s Molette Biology Laboratory, which is directed by Biological Sciences Professor Kenneth Halanych, led a team of scientists from Auburn and the Universities of Alabama and Florida, in a project designed to better understand the evolutionary relationships between ctenophores, as well as reexamine the placement of ctenophores as the sister taxon to all other animals. Ctenophores comprise approximately 200 described species with complicated and unresolved relationships among the various lineages. Additionally, ctenophores are a diverse group containing numerous physiological and ecological differences. Scientists from all three Universities collected ctenophores from around the world and used modern genetic sequencing techniques to examine the genetic variation amongst ctenophores, further establish Ctenophora as the sister group to all other animals, and refine the genetic relationships between species of ctenophores. The team ultimately found that modern comb jellies diversified about 88 to 350 million years ago, much earlier than previously suspected. Nathan Whelan, who is now the director of U.S. Fish and Wildlife Service’s Southeast Conservation Genetics Lab, is the lead scientist on the study and was a postdoctoral researcher in Auburn’s Mollett Lab at the time of the study. Whelan also holds a doctorate from the University of Alabama. "Being a postdoctoral researcher at Auburn and in Ken Halanych’s lab gave me exceptional opportunities to pursue my research interests, including animal evolution, genomics, and field biology,” said Whelan. 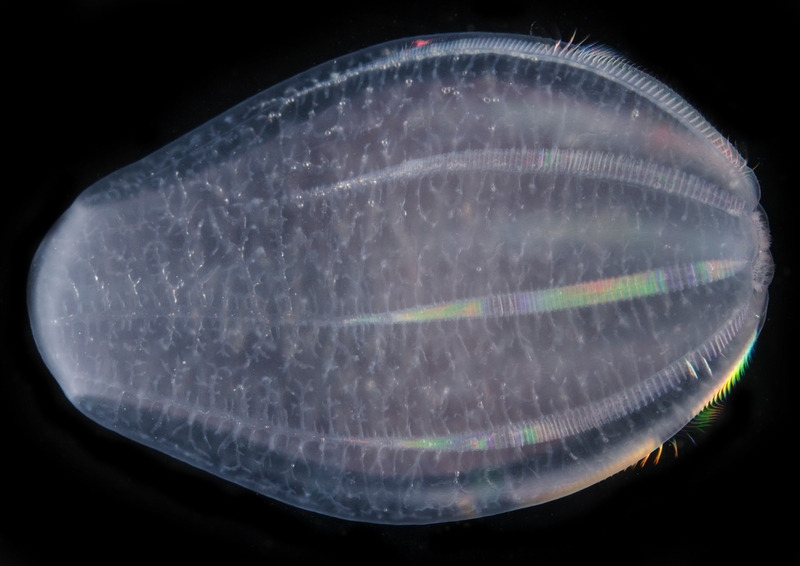 “Our work for this project reveals important patterns about early animal evolution and begins to unravel mysteries surrounding the diversity of comb jellies. By adding new data and continuing to challenge conventional wisdom, we have obtained much stronger results than in the past." Others working on the project include Kevin M. Kocot, a University of Alabama assistant professor of biological sciences and curator of Invertebrate Zoology in the Alabama Museum of Natural History. Kocot received his doctorate under the direction of Halanych at Auburn University, and for this project, he worked to provide bioinformatic and phylogenetic analyses and interpretations. Leonid Moroz, Distinguished Professor of Neuroscience, Genetics, Biology and Chemistry at the University of Florida, is a pioneer of comparative genomics and transcriptomics of ctenophores. Since 2007, he has collected the animals around the globe and sequenced them both on land and aboard oceanic research vessels. Thus, the team had access to unique genetic data from species covering the broadest diversity of forms and lifestyles within the enigmatic group. The results were recently published by Nature.com in a paper titled, “Ctenophore relationships and their placement as the sister group to all other animals,” and will be featured in an upcoming edition of the journal Nature Ecology and Evolution. The work was supported by NASA, the National Science Foundation, and the Ministry of Education of the Russian Federation. Pictured is a Beroe abyssicola ctenophore, or comb jelly. Beroids eat other comb jellies and lack tentacles. They encounter prey blindly by swimming and then engulf their food using a cavernous mouth. 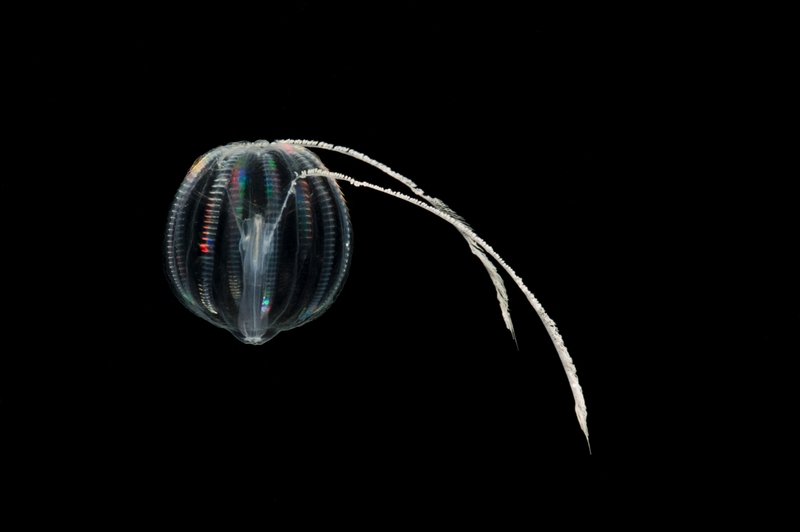 Pictured is Pleurobrachia bachei, a ctenophore, or comb jelly, commonly referred to as a “sea gooseberry.” The name “comb-jelly” refers to eight rows of hair-like cilia present on the body, which are known as comb-rows and enable the animal to swim.